When working on classic vehicles, and especially when modifying them outside of their stock configurations, things can get expensive. It’s a basic principle in economics: the rarer something is the more money somebody can charge you for it. But if you’ve got the skills and the necessary equipment, you can occasionally save yourself money by custom-fabricating some parts yourself. After changing the gear ratio in his 1971 Ford F100, [smpstech] needed to adjust his speedometer to compensate. Unfortunately, a commercial speedometer reducer and the new cables to get it hooked up to his dash would have run into the hundreds of dollars, so he decided to try designing and 3D printing his own gearbox. The resulting development process and final product are a perfect example of how even a cheap desktop 3D printer, in the hands of a capable operator, can do a lot more than print out little toy boats. The gearbox contains a large ring gear driven by a smaller, offset, spur gear. This compact inline package drops the speed of the input shaft by 25.5%, which [smpstech] mentions is actually a bit slower than necessary, but it does give him some wiggle room if he decides to change his tire size. 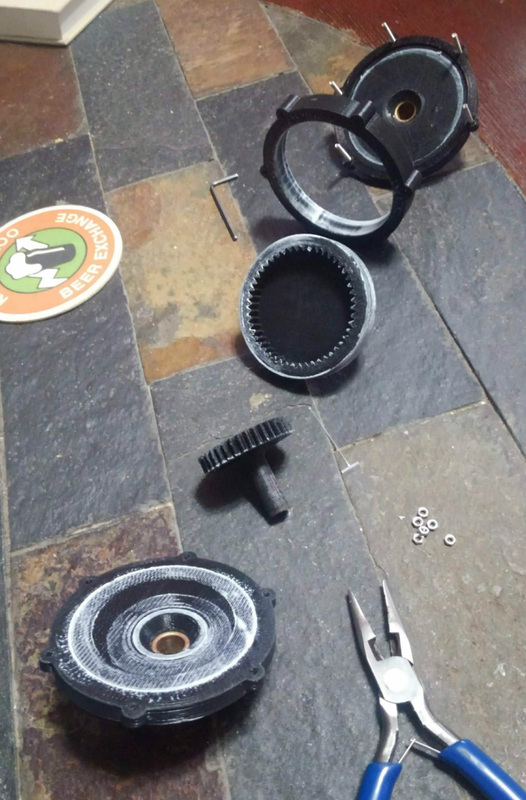 Even if you’re not looking for a speedometer reducer for a nearly 50 year old truck, there are some lessons to be learned here in regards to 3D printed car parts. The first version of his gearbox, while functional initially, ended up looking like a deflated balloon after being exposed to the temperatures inside the F100’s engine bay. His cheapo PLA filament, which is probably fine for the aforementioned toy boats, simply wasn’t the right material for the job. [smpstech] then reprinted the gadget in HTPLA, which needs to be annealed after printing to reach full strength. Usually this would involve a low-temperature bake in the oven, but he found that simmering the parts in a pot of water on the stove gave him better control over the temperature. Not only did the HTPLA version handle the under-hood conditions better, it was also strong enough that he was able to use a standard die on the connections for the speedometer cables to create the threads instead of having to model and print them. Definitely a material to keep an eye on if regular PLA isn’t cutting it for you. This isn’t the first time we’ve seen 3D printed parts used to get a vintage vehicle back on the road. Building these custom parts would have been possible without a 3D printer, of course, but it’s a good example of how the technology can make these types of repairs faster and easier. Does everyone watch a load of videos on YouTube that are somewhat on the unadmissibly geeky side? In my case I might not care to admit that I have a lot of videos featuring tractors in my timeline. The mighty Russian Kirovets hauling loads through the impossible terrain of the taiga, tiny overloaded 2WD tractors in India pulling wheelies, and JCB Fastracs tearing around the British Fenland. You can take the girl off the farm, but you can’t take the farm out of the girl. So my recommendations have something of an agricultural flavor. Like the video below the break, a 1917 silent film promoting the Ford Model B tractor. This one was eye-catching because it was a machine I’d not seen before, a rather unusual three-wheeler design with two driving wheels at the front and a single rear steering wheel. During the early years of the twentieth century the shape of the modern tractor was beginning to evolve, this must have been a late attempt at an alternative. Speaking from the viewpoint of someone who has operated a few tractors in her time it does not look the easiest machine to control, that cloud of exhaust smoke surrounding the driver would not be pleasant, and the operating position hanging over the implement coupling at the rear does not look particularly comfortable or safe. The film has a charming period feel, and tells the tale of a farmer’s son who tires of the drudgery of manual farm labor, and leaves for the city. He finds a job at the tractor factory and eventually becomes a tractor salesman, along the way meeting and marrying the daughter of a satisfied customer. He returns home with his bride, and a shiny new tractor to release his father from ceaseless labor. Along the way we gain a fascinating look at agriculture on the brink of mass mechanization, as well as the inside of a tractor factory of the time with an assembly sequence in which they appear to use no fasteners. All of this is very interesting, but the real nugget in the story lies with its manufacturer. This is a Ford Model B tractor. But it’s not a Ford Model B. Confused? So, it seems were the customers. The Ford we all know is the Michigan-based motor company of Henry Ford, who were already very much a big name in 1917. This Ford however comes from the Ford Tractor Co, of South Dakota, an enterprise set up by a shady businessman to cash in on the Ford brand, manufacturing an already outdated and inferior machine backed up by dubious claims of its capabilities. On the staff was an engineer called Ford who lent his name to the company, but he bore no relation to Henry Ford. The company didn’t last long, collapsing soon after the date of this film, and very few of its products survived. 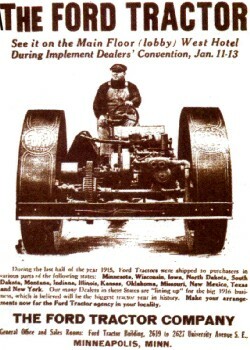 It did have one legacy though, the awful quality of one of its tractors is reputed to have been the impetus behind the founding of the Nebraska Tractor Test Laboratory, the place where if you sell a tractor in the USA, you’ll have to have it tested to ensure it performs as it should. In their museum they house one of the few surviving Ford Model B tractors. Meanwhile the Ford in Michigan produced their own very successful line of tractors, and their Fordson Model F from the same year is a visible ancestor of today’s machines. But as the video below shows, there’s nothing new about a fake. We had to giggle at this one when it came down the tips line. Last week, a woman involved in a hit-and-run fled the scene — only to have her car call 911 for her. Driving a brand new 670 horsepower Roucsh stage 3 Mustang while wearing virtual reality goggles. Sounds nuts right? That’s exactly what Castrol Oil’s advertising agency came up with though. They didn’t want to just make a commercial though – they wanted to do the real thing. Enter [Adam and Glenn], the engineers who were tasked with getting data from the car into a high end gaming PC. The computer was running a custom simulation under the Unreal Engine. El Toro field provided a vast expanse of empty tarmac to drive the car without worry of hitting any real world obstacles. The Oculus Rift was never designed to be operated inside a moving vehicle, so it presented a unique challenge for [Adam and Glenn]. Every time the car turned or spun, the Oculus’ on-board Inertial Measurement Unit (IMU) would think driver [Matt Powers] was turning his head. At one point [Matt] was trying to drive while the game engine had him sitting in the passenger seat turned sideways. The solution was to install a 9 degree of freedom IMU in the car, then subtract the movements of that IMU from the one in the Rift. GPS data came from a Real Time Kinematic (RTK) GPS unit. Unfortunately, the GPS had a 5Hz update rate – not nearly fast enough for a car moving close to 100 MPH. The GPS was relegated to aligning the virtual and real worlds at the start of the simulation. The rest of the data came from the IMUs and the car’s own CAN bus. [Adam and Glenn] used an Arduino with a Microchip mcp2515 can bus interface to read values such as steering angle, throttle position, brake pressure, and wheel spin. The data was then passed on to the Unreal engine. The Arduino code is up on Github, though the team had to sanitize some of Ford’s proprietary CAN message data to avoid a lawsuit. It’s worth noting that [Adam and Glenn] didn’t have any support from Ford on this, they just sniffed the CAN network to determine each message ID. The final video has the Hollywood treatment. “In game” footage has been replaced with pre-rendered sequences, which look so good we’d think the whole thing was fake, that is if we didn’t know better. Click past the break for the final commercial and some behind the scenes footage.